The breakfast menu is extensive from French toast and waffles to “egg” muffins, tofu scrambles and freshly baked muffins.They offer several tofu scrambles ranging in price from $5.50 – $7.00 for the fully loaded scramble. 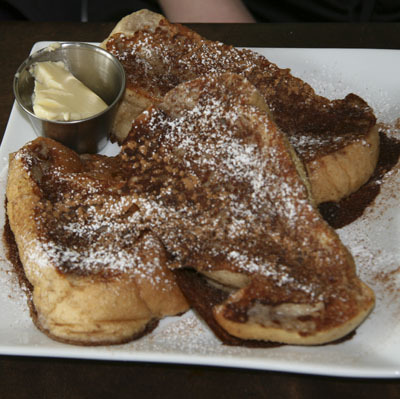 Angie ordered the French toast which was decadently delicious at $5. You can order fruit on top for an another $1. Maria, order the blueberry muffin, $2. A different kind of muffin is baked fresh every morning. They only bake a dozen and when they are gone, they’re gone. 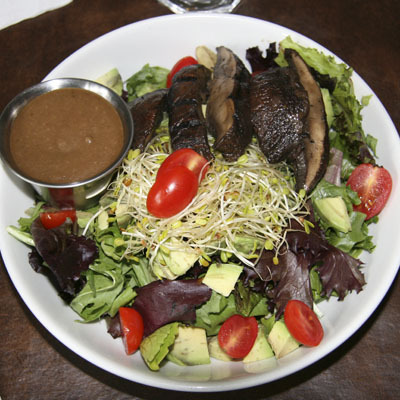 John had the grilled portobello salad, which was a hearty dish of fresh mixed lettuces topped with grilled portobello slices which have been marinated in balsamic vinegar, olive oil and fresh herbs. It is topped with grape tomatoes and bean sprouts with a balsamic vinaigrette. 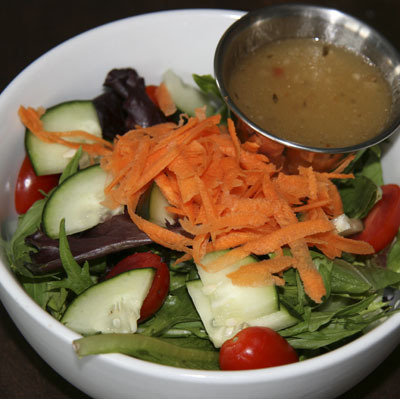 It is reasonably priced at $6.75 for a large salad and $4.25 for the smaller version. He also had a small serving of the soup of the day, $2. 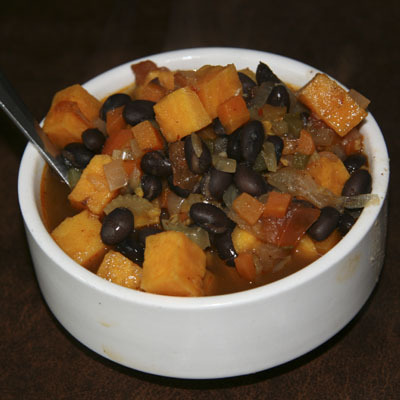 Tina had bowl of the soup of the day ($5) which was a spicy black bean and butternut squash with celery, onions and bell peppers. It had a nice little kick but wasn’t overly hot. It seems the daily soup can be anything. What we had was certainly delicious. 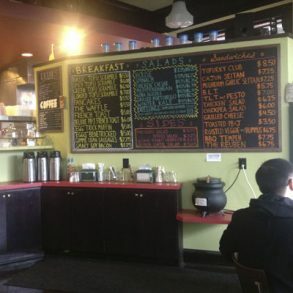 There are numerous sweet treats and side dishes, coffees, teas and soy milk shakes. Overall, the prices are reasonable, the food is very good as witnessed by the steady stream of happy diners coming and going. I watched a bearded gentleman lick his fingers with an expression of ecstasy as he polished off their famous Reuben sandwich. Pizzas are offered on Fridays only from the hours of 6pm – 2am. 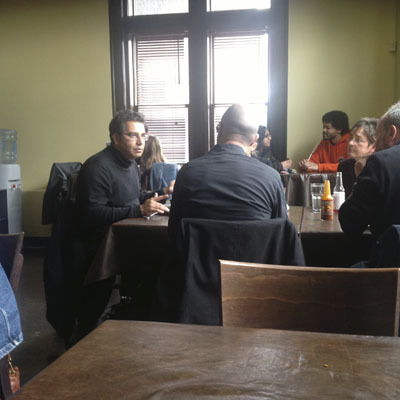 Their pizza prices range from $12 – $28. 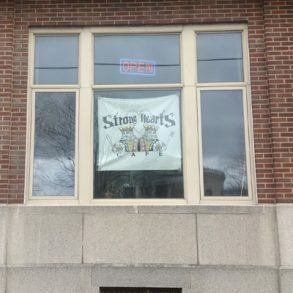 Strong Hearts Cafe is open from 8am-12am Mon-Thurs and 8am – 1am Friday-Sunday. 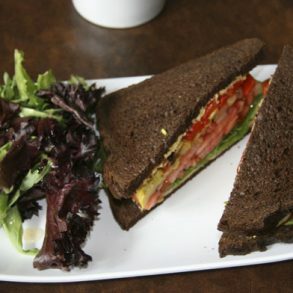 If you are searching for vegan food in Syracuse, your search is over. There is surely something to suit your palate at Strong Hearts Cafe.